My guides’ answer was as simple as it was profound: “God is all that is.” That answer has never changed over all these years. It took me a while to integrate their answer into my thinking and my work. Today it’s an integral part of both. It’s also a source of great personal and spiritual comfort to me. If God is all that is, there can be nothing “evil” in the world. Evil is not part of God. Evil is simply a fiction, one of many we humans have created, that keeps us living in illusion. Humans all too often give God credit for the good things, or what they define as “good.” And they blame God for all they define as “bad” or “evil.” A common question we often get from people is “How could God allow (fill in the blanks here — war, death, cruelty, illness, etc. etc.). The problem is the “you” (what you call “ego”) who created war, death, etc. has become divorced from the “you” that is God. Do you really believe you are God? You probably don’t have trouble seeing God — or at least the hand of God — in a beautiful sunrise, a green peaceful valley, a baby’s eyes, a majestic mountain. But to see God in yourself is difficult — and perhaps even more difficult, in other humans. That’s the real challenge. In fact, that challenge is your entire reason for choosing to come into physical life. You came so God could see and experience the physical world through your eyes. But a short time after you were born you were talked out of what you knew as an infant. You were literally brainwashed into believing you were not worthy. “I am not worthy” was a “mantra” that was part of the religious services in the church of John’s childhood. 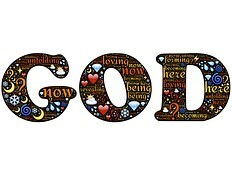 Once you can fully see and accept yourself as literally God, then you will know God is in everything you see. We’d suggest a good way to begin, or to accelerate, this process is to find something good, something positive that makes you feel good, in every person, every experience, every part of the natural world. Do that every day. Yes, there is much in your news media you do not feel good about. But see all that for what it is — illusion. And don’t pay any attention to it. It is not reality. The only true reality is love. God is love. You are love. What do you think an interview with God would be like? I love this video. If God Is All-Powerful, Why Does S/he Allow Suffering, Like Ebola? How do you define God, or the divine energy? Do you believe you are part of God? Please share your thoughts and comments with us below. Everything and everyone is created through and underwritten by Unconditional Love which loves us so completely it grants us total freewill. As an astrologer I see over and over how every one of us is totally unique. Even though many people could have the same experience, each would have a different view of it due to their individual make-up. Thus All-That-Is experiences that diversity through each and every one of us. Thank you for your hands-on approach John. I’m sure, with your astrology work, you see the uniqueness in each of us more clearly than many. I think it’s that uniqueness, and the diversity, that make life so much fun. Thank you for this message and video. They were just what I was needing remember. I too went to a parochial high school — so I know what you mean about the harshness. Fortunately, I went to a Jesuit college, where the atmosphere was much more open-minded, even liberal. That’s where I learned to question God and reality. As you say, it’s a real gift. I deeply appreciate your most kind words. Though I don’t always see the God in everyone — but when I don’t something/someone usually gives me good swift reminder. It’s always a pleasure for me to connect with all of you on this forum. Thank you for the tool that Spirit gave us…to practice discerning the good. Sweet video! I hope the creator if it will proofread and edit it, though. Thanks very much, Pat. I thought that about the video too — but I overlooked it because, otherwise, it’s great. What is your definition of the God that is being manifested? Boy, what a question. I believe that there is no one definition in order to define God. If I had to choose a word anyway it would be Everything. There just is not anything that is not God manifesting on one of the multitudinous frequencies. In the lowest frequencies that would be without much if any conscious awareness but still a manifestation of God. We cannot get away from God however we might try as we are a part of God. In our case with a very much diminished awareness as we put on a blindfold so to speak before we entered in this physical body in order to have certain experiences. What fun is playing a game if you know all the best possibilities and the answers to all the questions already? The fun is in finding out and inventing new possibilities for ourselves. We do have all the potentials of God in us, even though they have not been activated yet. I think you can see us (humans, animals, plants, minerals, cells, atoms, quanta, planets, stars, galaxies, universes a.s.o.) as points of focus of attention of God. Each of us is a cell or an atom in a greater universe and is a universe to smaller entities. God as the highest entity of all is encompassing all of us and perceiving and experiencing through us. As we are experiencing through our organs and cells and atoms and maybe are ‘god’ to them. There is no God that is separate from us but when you consider us to be the focal points in the feet of God (using the metaphor of a human body) as we live in the densest frequency vibrations and the focal point that encompasses all is the brain, you can also imagine communication between the feet and the brain in order to make them function. So while there is no God outside us because we are in God and God is in us, we still may want to experience communication and pretend that God is outside of us. The fact is that we cannot possibly understand how things are in Reality with a capital R as long as we are still wearing this blindfold. We are waking up though because we are now at least aware that we are wearing a blindfold and that this world is nothing but an illusion. So maybe we should stop arguing about what really happened in whatever time and whatever place, because none of that is real anyway, except the Love and Conscious Awareness we gained from whatever happened in the world we created. Thanks very much, Anny. You said it all beautifully! Thank you John for those beautiful messages from Spirit and from you of course. I don’t often leave a reply, but I enjoy your newsletters very much. So thank you for that again. I learn a lot from the messages. Thanks very much, Pim, for your kind words — I really appreciate it! I’m delighted to hear the messages are helpful to you.